Screen shot from a Crossroads GPS ad titled "Basketball"
A new TV ad from Crossroads GPS features an actress playing a downcast mother of two jobless adult children. She says “things changed for the worse” after she supported Barack Obama for president. Her voice is soft, and so is the background music — but her situation is unlikely; her opinions are harsh; and her facts are one-sided and not always accurate. This 60-second ad is the second in an announced $25 million campaign to soften up the president in key battleground states. It uses a much lighter touch than the first ad — which contained so many factually misleading attacks that it took two articles for us to cover them all. But make no mistake: Inside the velvet glove there’s still a fist, pounding away with one-sided, sometimes inaccurate statements. The woman blames the president alone for high unemployment, excessive federal spending, soaring debt and rising health insurance premiums. She misrepresents President Obama’s position on taxes, which he has cut repeatedly, and the ad even shows a fake headline saying gasoline prices “continue to rise” when in fact they have been falling for weeks. The group said it would spend $9.7 million airing the new ad for three weeks in Colorado, Florida, Iowa, Michigan, North Carolina, New Hampshire, Nevada, Ohio, Pennsylvania and Virginia. That’s an artful bid for viewers’ sympathy, but it’s a very unlikely situation. For young adults of post-college age, 25 through 29, the jobless rate was 10.3 percent last year, and 8.2 percent in April, according to the Bureau of Labor Statistics. That’s higher than usual but still leaves only about a 1 in 10 chance that a single child of that age would be jobless. And to have both adult children unemployed at the same time and forced to live with a parent — while sad, and not impossible — would be much more rare. The mother says, “I supported President Obama because he spoke so beautifully,” but then “things changed for the worse.” What follows are opinions and claims that hit hard, but don’t always line up with the facts. We’ll take them in order. Claim: “Obama started spending like our credit cards have no limit,” says the fictional mom. Fact: When Obama took office in January 2009, the federal deficit was already running at $1.2 trillion for the fiscal year that had begun nearly four months earlier, according to the nonpartisan Congressional Budget Office. It has risen since then, and Obama has failed to make good on a promise to cut the deficit by half. But it’s misleading to say Obama “started” spending borrowed money. In fact, the numbers show spending actually has increased far more slowly under Obama’s budgets that it did under Bush’s, and more slowly than under any president in half a century. An analysis by the Wall Street Journal’s “MarketWatch” website on May 22 shows spending under Obama rising at an average rate of just 1.4 percent per year. Spending under Bush rose 7.3 percent per year during his first term, and 8.1 percent per year in his second term. “[S]pending is rising at the slowest pace since Dwight Eisenhower brought the Korean War to an end in the 1950s,” wrote MarketWatch’s Rex Nutting. And after adjusting for inflation, Nutting notes, federal spending is actually falling under Obama — the first time that’s happened since the end of the Vietnam war. Fact: That’s true, but the main cause of higher premiums is still the rising costs of medical care in general. As we’ve reported before, independent experts say the health care law caused only about a 1 percent to 3 percent increase in premiums last year — just a part of the total 9 percent rise for the year. And one of the reasons the law has caused a slight rise in premiums is because it requires insurance companies to cover a family’s children until they reach age 26. We’re not told how old the jobless children are, but one or both might have coverage under their mother’s plan, thanks to the new law. Fact: That’s true. But the bailout legislation was sought and signed in 2008 by President Bush, and 82 percent of all disbursed funds under that program have now been recovered under Obama, according to the Treasury Department’s Daily TARP Update for May 22. 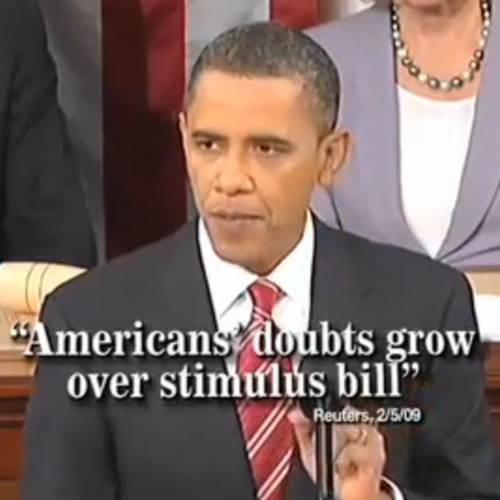 As for the stimulus that Obama signed in 2009, unemployment would have been significantly worse without it, according to the Congressional Budget Office — though in the longer term, CBO says that spending borrowed funds on the stimulus creates a drag that will lead to “a little lower” economic output at the end of the decade. Fact: It’s true that total federal debt (including money the government owes to itself) has risen by nearly $5.1 trillion since the day the president took office. And that’s actually a little more — $16,227 — than the per capita figure the ad uses. But as noted earlier, Obama inherited a huge deficit. And a president alone cannot cut spending or raise taxes — either of which would reduce deficits and slow the growth of the debt — without cooperation from Congress. Fact: Actually, this woman (who tells us she is still working) would have benefited from tax cutssought and signed by Obama. If she’s making $50,000 a year, the most recent cuts in payroll taxes would have been worth $1,000 to her both last year and this year. And the president has also offered huge spending cuts in exchange for any future tax increase on top-bracket earners. He met for days with House Speaker John Boehner and other Republican leaders during last year’s debt-ceiling negotiations. But so far such a “grand bargain” to slash the deficit has proven elusive, with each side blaming the other. Fact: Actually, about 3.7 million jobs have already been created since things hit bottom in February 2010. Our fictional mother also glosses over a contradiction: cutting taxes increases debt, unless even bigger cuts are made in spending, which she doesn’t mention. Fact: This false claim is made in a fake newspaper headline that appears on screen. The truth is that gasoline prices have been dropping lately. In fact, the national average price for regular gasolinehasn’t been as high at any time under Obama as it was briefly under Bush, when it topped $4 a gallon for six weeks in the summer of 2008. That’s still a record, as measured officially by the U.S. Energy Information Administration. The average price then plunged to $1.59 in the final week of 2008, due to the financial crisis and resulting worldwide economic slowdown — the worst since the Great Depression. From there it started climbing back up even before Obama was sworn in, and reached a peak under Obama of $3.90 in May of last year. This year the highest was nearly $3.88 during the week that ended April 9. But in each of the six weeks since then it has dropped. As of May 21 — the day before the ad was announced — it was just over $3.62, or about 25 cents a gallon lower than in early April, and 43 cents below the record week recorded in July 2008. The Times quoted Crossroads GPS president Steven Law as saying this ad is aimed at voters who may like President Obama but are disillusioned. And it called it a “subtler” entry than the group’s previous attack ads. But it’s an attack ad nonetheless. And it uses factual claims to deceive, not to inform.